Last November, we announced the release of our Chrome Lead Clipper extension for Gmail. Since then, with great feedback from our customers, we’ve added some major updates to help improve your lead generation abilities. 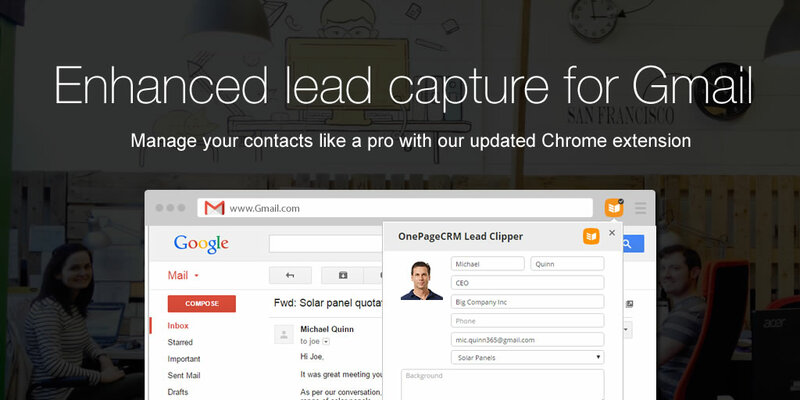 The first version of our Chrome Lead Clipper extension focused primarily on capturing contact names, profile pictures and email addresses from Gmail. Now, thanks to our recent integration with Full Contact, with just one click we’ll automatically add enriched profile details – including public profiles and social media accounts. So when you receive an email from a new lead, or get a reply from an existing one, you’ll have a much clearer picture of who they are. Click on the Chrome Clipper icon and leave the rest up to us! We’ll do all the hard work by moving the information into your account. OnePageCRM brings you closer to a zero-admin environment for managing and nurturing your contacts. You can download our Chrome Lead Clipper extension from the Chrome Web Store. If you’ve got any thoughts or suggestions, please comment below, contact me at brianm@onepagecrm.com or Tweet us @OnePageCRM. Great Plugin! A bit shame that it can’t be utilized if You use Gmail in a standalone window though. Hi Artur, thanks for your feedback! That’s actually not something we considered, but it’s a great user scenario. Definitely something to bring to the dev team. Thanks for that. Brian. Is there any way of doing this on Android or iOS? I’m no longer a fan of windows. Hi Nigel, I’m afraid the clipper works as a desktop browser extension only.